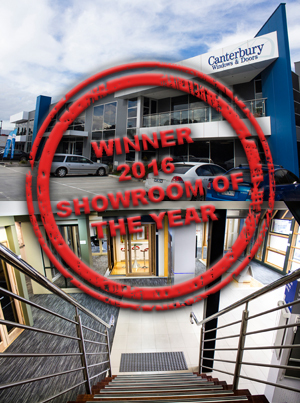 Congratulations to the Southern Star Group on achieving the award of 2016 Showroom of the Year! Our Canterbury Timber Windows and Doors Showroom in Clayton South clinched the title in the Large Showroom category this week. The Australian Window Association Design Awards were open to all members of the Australian Window Association, the Australasian Institute of Surface Finishing and the Skylight Industry Association. The awards highlight excellence within the industry, with categories spanning from renovation to innovation. The Southern Star Group is proud to have been highlighted and judged as a winner amongst such high standards and competition. Our Clayton South Showroom features state of the art elements and displays from touch screen technology kiosks to specially designed real-world interactive product showcasing. Amongst the criteria considered during judging is the quality of display, sales/staff members and street presence. We are also proud of our showrooms energy efficiency and ease of access/parking, which also contributed to the win. Our award-winning showroom is located at 590 Heatherton Road, Clayton South Victoria. Pop on in and discover why we are the 2016 Showroom of the Year!